On Sunday as I drove home following Saturday’s board meeting, I thought about Ed’s comment during the 3-hr. drive through gorgeous fall colors of rusts, yellows, bronzes. And it struck me that music is so powerful because it is so positive. Words can be demeaning. They can reflect the worst of human nature – as I heard every time I turned on the radio during my drive and heard vitriol from one of the campaigns – before I switched back to my Gershwin CD. Words can wound, they can hurt, they can lie and deceive. But music does not wound, it does not hurt, lie, or deceive. Music is never negative!! We may like or dislike a particular piece or style of music, but there is nothing inherently negative in the music itself. This is not to say that it isn’t sometimes used as a background for hateful or negative ideas. And it certainly is used to elicit a variety of emotions in everything from movie soundtracks to campaign appearances because music can be sad, melancholy, upbeat, soothing, cheerful. The lyrics added to music can be hurtful, but music itself cannot. Music doesn’t make any class of people feel “lesser,” doesn’t diminish anyone, doesn’t insult anyone. It has the power to make people feel better – which is why so many people spend so many hours every day listening to music. For many of us, listening to or making music provides needed calm, reflection, and renewal – a link to our inner selves. But for one group of people, wounded veterans, music can be an exponentially greater lifeline – a means of rebuilding hope, and a return from a shattered life. Thousands of veterans have been catastrophically wounded, mentally or physically, and face a life filled with agony and hopelessness. Since 9/11, veterans have returned from Iraq and Afghanistan who would never have made it home in previous wars because of so many advances today in the quality of battle armor and battlefield medicine. These vets may be alive, but their horrific injuries have made life, in many cases, unbearable. Some are missing multiple limbs, some suffer from PTSD (Post Traumatic Stress Disorder) or TBI (Traumatic Brain Injury). Many of these severely wounded veterans spend 2 or 3 years or longer at Walter Reed Army Medical Center. So what’s the connection with music, and what is MusiCorps? In 2007, pianist/composer Arthur Bloom was asked by someone at Walter Reed if he had any ideas for helping a severely wounded soldier, a drummer who had lost a leg in Iraq and was no longer able to play his drum kit. 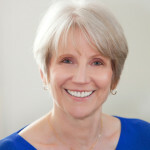 Bloom, who has a degree in literature from Yale and music degrees from Juilliard and the Yale School of Music, is the founder of RIME (Renovation in Music Education), a nonprofit that works with arts organizations and communities in setting up innovative arts partnership programs. 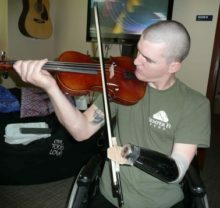 Bloom and his staff of professional musicians teach wounded soldiers who previously played an instrument how to adapt the playing skills they already have to their new physical circumstances, such as needing to compensate for a missing arm or leg. And they teach non-musicians how to play an instrument – and to excel. The vets also learn to write and arrange music. An official “session” with a teacher lasts anywhere from 45 min to 7 hours. They study any kind of music, depending on what the veteran is interested in – from C. P. E. Bach (USMC Cpl. Todd Love, above) to rock, death metal, and even Italian opera. They practice for hours a day. One vet says there have been times when he played his guitar for 20 hours a day. The MusiCorps Wounded Warrior Band is the performance arm of the program. They have performed for millions of people, and while people initially notice that the members of the band are wounded, they soon become caught up in the high-quality music making. They have performed with Pink Floyd’s Roger Waters at Constitution Hall in Washington, D.C., (along with Sheryl Crow, Billy Corgan of Smashing Pumpkins, and Tom Morello of Rage Against the Machine), with world-renown cellist Yo-Yo Ma at the Kennedy Center, with singer Oleta Adams and the Kansas City Symphony. They have appeared on the Colbert Report and on the special 300th episode in the television series NCIS, and have been covered by all of the major television networks. Yo-Yo Ma said during his work with MusiCorps, “The essence of music is a deep form of communication. 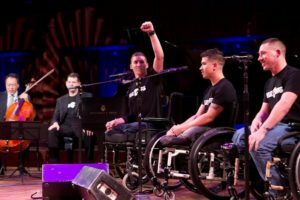 You have these sounds, but they reflect something that someone is crying out to say and to express.” And music becomes the vehicle for these wounded vets to get back in touch with who they really are and to find a way to express what they see as their true selves – beyond the disabilities. It gives them hope for a better life. I could write about what making music is doing to rewire the brains of these veterans, but the real story here is that music has tremendous power – for healing, for good, for hope, and for changing peoples’ lives, as you will see if you look at some of the videos linked in this post or on the MusiCorps website. You may even want to consider making a donation to MusiCorps because they receive no funding from Walter Reed or the U.S. government. Founder Arthur Bloom would like to expand MusiCorps throughout the US and beyond. Maybe we can think about the power of music to heal and find a way to help these wounded vets recover part of who they are through music, and perhaps help ourselves in the process. Dear Readers, Thank you for your overwhelming response to this post. There are too many comments to upload, but I appreciate, as always, your input. Your personal reactions and stories have touched me deeply.